To prepare, educators should install the Link4Fun App and connect it with the Link4Fun Book. The book should be placed on a table that is appropriate for the child’s height and seating. 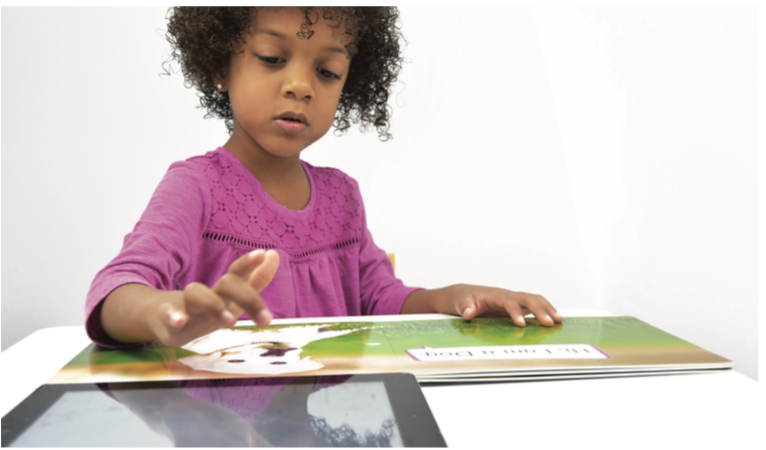 The child should be able to comfortably touch and view the book and iPad from his/her position. Show the student the cover of the book and ask, “What do you think this book will be about?” Have the student use details from the cover to explain his/her guess. Turn to the first page and have the student listen to the book read out loud. Ask the student to repeat the words read out loud and use his/her fingers to point to each word as he/she reads. Ask the student what else he/she might want to find out about the animal in the book. Indicate that the tabs on the app can be used to find out more about the animal. Ask the student the make predictions about the response to the question. 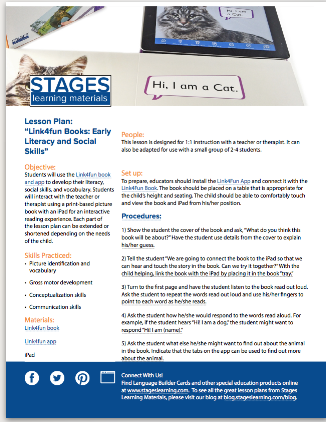 Explore the interactive elements of the book with the student. Ask the student to tell a story about the animal based on the new information he/she learned. Repeat steps 9-10 with subsequent pages and new animals.